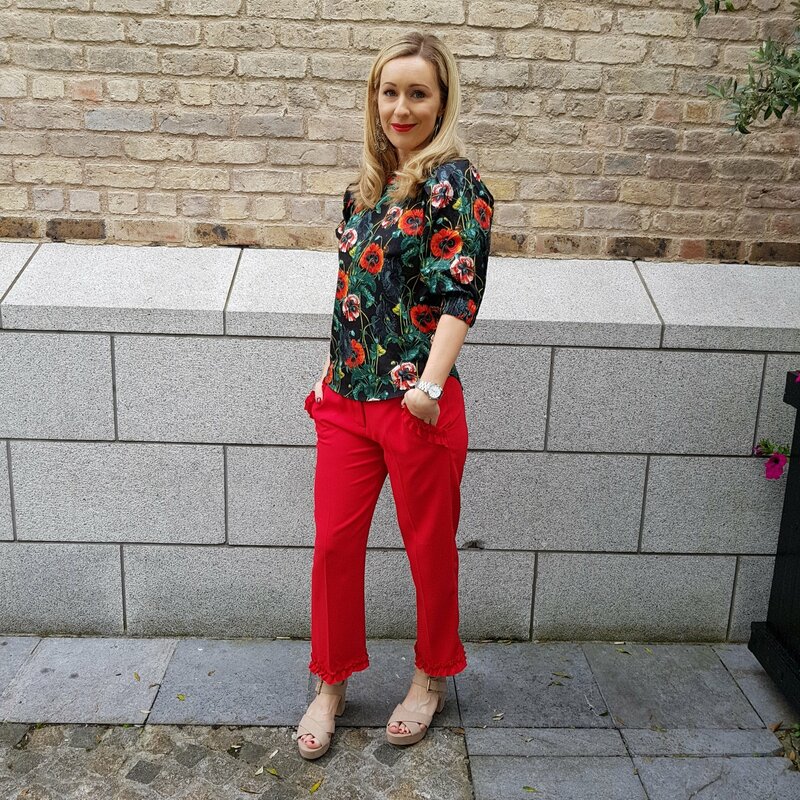 Ruffle trousers – friend or foe? Can we settle for frenemy? Let’s be frank (forget Mary for now), we’ve all dabbled in the ruffle trend. The ruffle had us enraptured this season in its different forms: From House of Holland’s candy hued co-ords to Richard Malone’s architecturally shaped Popeye prints and Gucci’s floundering maxi dresses, the runway designers led the way for the high street pieces that followed. Early spring saw the humble trouser trumped by the statement sleeve with leg of mutton, trumpet, Bardot and ruffle-tastic iterations giving us yet another reason to be a woo-girl. Well, dear trousers, it’s finally your time in the sun. Welcome to the Lebensraum for Legs. Just for the frill of it, I’ve styled one pair of ruffle trousers three ways. Build an entire look around one piece AND maximise cost-per-wear? Yes please. Bella Freud does it best, Eoin McLove had one inside a cake and there’s even a film with the same name. It’s the trusty jumper – your failsafe piece to surviving the Irish weather. The days of mandatory trouser suits in the office are long gone. Dress to impress with florals, frills and functional footwear – the holy trinity of any working gal’s wardrobe arsenal. Boots: Asos, previous season. Similar here (black/silver stars), here (clear patent/silver stars) and here (red/gold stars). Pic credits go to the random strangers on the streets of Kilkenny. Random acts of kindness do exist!